Like any millennial who commits a social media faux pas, Jones responded by deleting his Twitter account, and was roundly mocked on the Internet for a day or two. He seemed destined to be remembered as the Ohio State player who tweeted that he “ain’t come to play SCHOOL,” if only because he was buried on the depth chart at the time and appeared unlikely to ever do anything particularly memorable on the field. 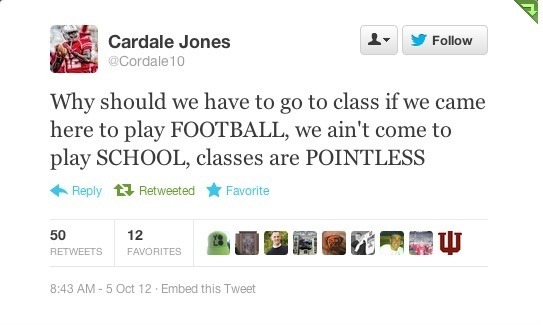 He’d serve as a cautionary tale for how college athletes should not use Twitter, and that would be it. Of course, that wasn’t it. We were wrong about Jones’s playing ability, which proved to be pretty decent when he took over the starting quarterback job late last season and led the Buckeyes to the championship. And we were wrong about his social media savvy, which has improved a great deal since 2012. He created a new Twitter account shortly after deleting his old one, and his growth on the platform has never been more evident than in recent days, when Jones has become embroiled in an online beef with Bulls forward Joakim Noah, of all people. It started at Game 2 of the Cavs-Bulls series, which Jones attended with some of his OSU teammates. During a timeout, the Buckeyes were brought out onto the court in an attempt to hype up the crowd, but Noah was apparently decidedly unmoved by the spectacle. Obviously, this sentiment was ridiculous for a number of reasons — chief among them that Jones steamrolled over Alabama, the SEC champ, on his way to leading the Buckeyes to a national title. Jones could have easily dismissed it as petty nonsense from a jealous Florida alum. But instead, he sensed an opportunity — an opportunity to fire back at one of the most despised athletes in Cleveland history, thus further positioning himself as an Ohio sports hero. Jones hasn’t let up a bit since. During Tuesday night’s critical Game 5, for example, he posted two more anti-Noah tweets, which quickly garnered more than 3,000 retweets and 4,000 favorites. As a result, his follower count is growing rapidly by the day, and so, too, is his favorability among Buckeyes fans. Surely, this is not a coincidence. Perhaps Jones is genuinely just using Twitter as an outlet to express his engaging personality, but even if that’s the case, it has helped him to become the most beloved Ohio State football player in recent memory. And while Urban Meyer certainly won’t name him the starting quarterback based on his social media prowess alone, it can’t hurt to be the fan favorite, especially when you’re fighting for every advantage you can get against exceedingly talented competition. All of which is to say that Jones has transformed into a certifiable Twitter genius and should probably become a brand strategy consultant when his football career is over. The Noah feud is only the latest example of this. In fact, it’s hard to keep track of the number of headlines Jones has amassed this offseason for his calculatedly brilliant tweets. Remember this legendary clarification? This NCAA Football story surfaced in January and, against all odds, continued to pop up in the news cycle through late April, when Jones was challenged to a showdown in NHL 15 by the hospital patient in question, a perfectly nice-seeming kid named Jared. Jones was having NONE of it, however. There was also the time he took it upon himself to invent a holiday called May Fools’. The concept was simple: April Fools’ Day, but in May. With Jones’s backing, it will undoubtedly become a national holiday in the very near future. After all, he’s got the president’s ear. I really, really hope that Akron coach Terry Bowden didn’t see that, for the sake of his heart health. The best part was Jones’s utter disregard for those who didn’t enjoy the prank, because nobody should ever apologize for being awesome. Still, it should be noted that Jones’s Twitter account isn’t only a hit with the kids. By wisely posting pictures of his daughter, Chloe, he’s managed to win over the most crucial demo there is: MOMS. Jones can even get meta on Twitter, especially when it comes to his infamous “ain’t come to play SCHOOL” tweet. He’s right: It is funny when he makes fun of himself. That’s the whole basis of humor, really, and Jones is a natural comedian on social media. We should all be so #blessed.